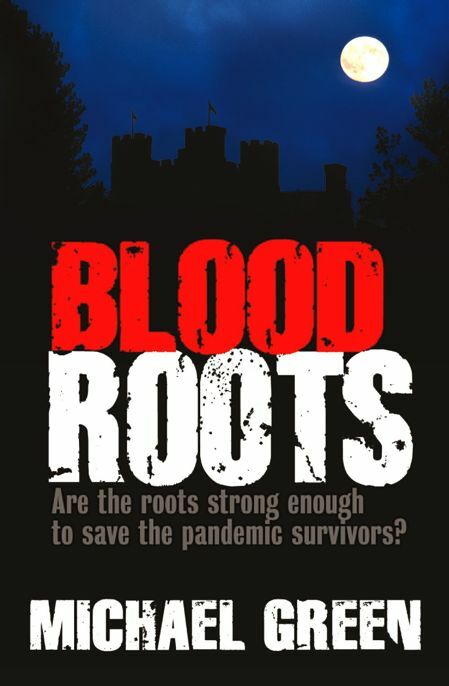 Blood Roots: Are the roots strong enough to save the pandemic survivors? by Verlagsgruppe Luebbe, Germany, republished in English as an e-book by MGC Limited. by Verlagsgruppe Luebbe, Germany, republished as an e-book by MGC Limited. This book is a work of fiction. Names, characters, places and incidents are either the product of the author’s imagination or are used fictitiously, and any resemblance to actual events, or persons living or dead, is entirely coincidental. This book is copyright. Except for the purposes of fair reviewing no part of this publication may be reproduced or transmitted in any form or by any means, electronic or mechanical, including photocopying, recording or any information storage and retrieval system, without permission in writing from the publisher. For their help in improving this manuscript, my thanks to John Q. Henderson and the late Shirley Henwood of Hibiscus Writers, Sarah Ell and Harriet Allan, who made some valuable suggestions. Mark Chatfield sat on the edge of the bed, rocking backwards and forwards, weeping. The corpse of his great-niece Holly lay cradled in his arms, her hand still clutching the greenstone tiki on the leather cord about her neck. Her dark eyes seemed to be staring accusingly at him; his fingers gently pulled the eyelids closed. His face, as white as his hair, was strained. He looked every one of his sixty-three years. Everyone was crying. Mark’s tall, sensitive, thirteen-year-old grandson Zach was being comforted by his sister Nicole. Although two years younger than her brother she was coping with the crisis better than anyone, and in addition to calming Zach she was hugging her stocky four-year-old sister Audrey. The old grey cat Misty was rubbing himself against Zach’s legs, as if trying to comfort him too. comprehend, Jessica and Fergus’s twin babies, Marion and Chelsea, were also crying. As Mark continued to sob, painful memories of the last five years threatened to overwhelm him. He remembered his family’s desperate fight to survive as the super-SARS pandemic took hold in New Zealand. Only he and his brother Christopher, together with their children and grandchildren, had survived — a mere eleven souls in the whole of the country. The Chatfield family alone appeared to possess the crucial gene which gave their bloodline immunity to the disease. Mark had realised that the group was too small and too closely related to guarantee the survival of future generations. This had prompted him and his son Steven to sail to England in search of other relatives. They had found forty-four of their relations living under the tyrannical rule of their cousin, Nigel Chatfield, at Haver House in Kent. After staging a daring escape, Mark and Steven had returned home, bringing with them some of those relatives in order to ensure the continued existence of the New Zealand population. However, they had arrived at Gulf Harbour to discover a tsunami had swept through their former home. Only the grandchildren had survived. The remains of Christopher and his two daughters had been found, but there had been no trace of Mark’s daughter, Jane. Fergus and Jessica, unaware of their uncle’s gloomy thoughts, became alarmed as his sobbing escalated into uncontrollable wailing. Mark’s loss of Jane had been compounded by the loss of his son Steven, who earlier that morning had sailed for England, taking his partner Penny, their baby son David, Penny’s son Lee and one of the other adult men, Luke Dalton, with him. Completing Mark’s misery was his discovery that his own pregnant partner Allison, desperate to return to her family, had stowed away on Steven’s yacht. Mark looked down at Holly, and eventually the peace on the little girl’s face calmed him. At last he was able to speak. Jessica glanced up at Fergus. Had Mark seen the look on her face, he wouldn’t have been so confident. ‘We need to bury Holly,’ Fergus said gently. A Maori funeral — a tangi — might have been Holly’s right, but Mark was using the ceremony as a delaying tactic, hoping Steven would return before the burial took place. Then he could explain to everyone that though Penny’s son Lee was an asymptomatic carrier of typhoid, he posed no risk to the other children at Gulf Harbour. Mark was now certain Lee carried a modified strain of typhoid — a strain that was only fatal to those such as Holly and her sister Zoë, who had also died of the disease, whose genes gave them dark skin. There had been no need for Steven to take his family back to England to save them from infection. There was no Maori meeting house close to Gulf Harbour on the Whangaparaoa Peninsula where the surviving Chatfield family members in New Zealand now lived. The closest marae was at Northcote, close to Auckland city. Mark knew it was not feasible to take Holly there; roads on the low-lying areas of the peninsula had been washed away by the recent tsunami. The only practical means of travel, apart from walking, was on horseback. Hampered by carrying the babies, as well as fallen trees and landslips, even that would be difficult. ‘We’ll have the tangi in her old bedroom at Harbour Village Drive,’ he announced. Zach and Nicole looked at him. Jessica saw the terror in the children’s eyes. They rarely ventured down the slopes of Marina Hill to the ruined canal-side properties. The memory of scrambling up the hill as the tsunami swept through the Mediterranean-style buildings continued to haunt them, as did the terror of the second wave that had trapped them upstairs in their home when they had returned to search for their Uncle Christopher. Mark reluctantly agreed. He knew he had only wanted to be down by the canal because that was where Steven would land when he arrived back. ‘Jessica and I will sit with Holly now,’ Fergus said. ‘Why don’t you take the children for a walk?’ Slowly Mark rose to his feet, and passed Holly to his cousin. Nicole took her grandfather’s hand and led him from the room, the other children following behind. Once outside, Mark’s strength and resolve returned. He became the leader again. Fighting his way through the long grass that covered the former golf course, he headed towards the clifftop. The going was tough, but helped by Nicole and Zach he struggled on. As they reached the promontory his pace slackened; there was no sail in sight. had not yet returned. He fought to hold back his tears. There is something very beautiful and special about a Maori tangihanga. The Maori believe that the deceased’s body — te tupapaku — should not be left alone before burial, and this was a practice the Gulf Harbour community embraced. Holly lay in the lounge in an open coffin, and the whole community slept on mattresses around her. The coffin was too big for her tiny figure. It was the coffin Mark had asked Steven, a joiner by trade, to build for him before he sailed. It had been his final throw of the dice, a last desperate attempt to prevent his son sailing. They all felt the presence of Holly’s spirit. When the adults were busy the children sat with her. Sometimes they would speak to her in Maori, practising the language skills they had learned at school. Misty the cat had abandoned his normal sleeping place on Nicole’s bed and taken up station at the foot of the coffin. back home, and then they would bury her. how many trips his uncle made across the golf course. At night, he would hear Mark sneak out of the lounge. Sometimes it would be well into the morning before he returned. ‘It’s time to bury Holly,’ Jessica said tenderly to Mark on the fifth morning. Fergus noticed the look of desperation in the older man’s face. ‘We’ll take her to the promontory overlooking Kotanui Island, and bury her beside Uncle Christopher,’ he said quietly. Fergus hurried off. Later that night, when the children were asleep and Mark had left for his nightly trek to the clifftop, he exhumed Zoë’s remains and placed them in what had been Steven’s old toolbox. The large box, Steven’s apprenticeship project, was just as beautifully made as Holly’s coffin. Shortly after daybreak the procession left the house on Marina Hill. Gina, Audrey, Tommy and Nicole led the way, carrying the toolbox. Behind them followed Mark and Zach with the beautiful coffin containing Holly. Bringing up the rear were Fergus and Jessica, holding the twins. As they trudged slowly along the well-worn path, Mark became aware of how tiny and vulnerable the Gulf Harbour community was. The loss of one child seemed to have tipped the scales disproportionately. to the two little part-Maori sisters; they had been the last members of their race. Mark’s sense of loss intensified. Steven had to come back. They desperately needed him, Penny, Lee, baby David, Luke and Allison to return. As they neared the two freshly dug graves, Mark continued to search the waters off Whangaparaoa; there was no sail to be seen. And there was still no sail as he trudged wearily back along the footpath eight hours later to join the remainder of the community.